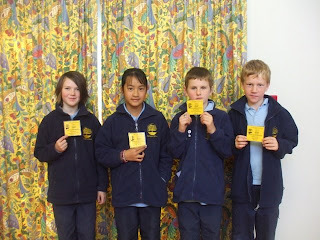 At today's senior assembly, four children were awarded Addington Article Reporter pages for their Citizen Passports. These children have had articles published on the school blog, and are now official Addington Article Reporters. Melissa, Damon, Bayleigh and Zane received their pages from Ms Heath. Addington Passports recognise children's achievements towards their citizenship at our school. This begins as soon as they start within the Junior school, and continues throughout their time at Addington. Other awards include, learning milestones, achievements within various school activities, both sporting and cultural, and leadership roles within our school. By the time children leave Addington School at the end of year six, they will have amassed a wonderful collection of pages within their passports reflecting their achievements during their time with us. 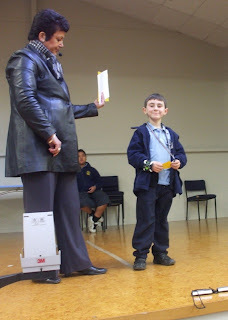 Also receiving an award today was Khale for his amazing work as our official "Wet Grass Manager".